After a thrilling encounter in the first match, South Africa are set to host Sri Lanka at SuperSport Park for the second T20I. The hosts won a nail-biting contest in the previous match to lead the three-match series 1-0. Sri Lanka on their part will try to bounce back in this do-or-die game if they want to stay alive in the series, so we can expect another enthralling battle between the two teams. 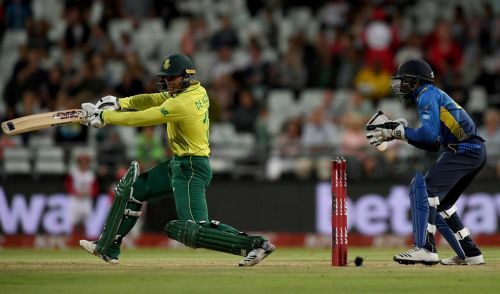 The Proteas won the first T20I in the Super Over courtesy Imran Tahir’s heroics. With the ICC World Cup 2019 in sight, the visitors need to get the perfect balance in the squad for the mega event. JP Duminy will lead the home side in Faf du Plessis’s absence, as the latter has been rested for the remaining two games. South Africa would be looking to seal the series before the third match, so that they can experiment even more. On the other hand, Sri Lanka have been struggling in limited-overs cricket ever since a few of their veterans retired from the national team. After winning the Test series 2-0, the visitors suffered a 5-0 whitewash in the ODI series, and have now lost six matches on the trot. Sri Lanka have to find out a way soon if they want to avoid losing yet another limited overs series. Lasith Malinga and Co would be hoping to land a counter-punch in the second match and draw the series level. - Quinton de Kock, Kagiso Rabada and skipper Faf du Plessis have been rested by the hosts for the rest of the series. - Chris Morris, Dwaine Pretorius and Andile Phehlukwayo are set to play. - JP Duminy will lead the home side in Faf du Plessis’s absence. - Anrich Nortje and Lungi Ngidi have been ruled out with their respective injuries. - Sri Lanka might replace Sadeera Samarawickrama with another middle order batsman.